This is the second book in the seven-book Gentlemen Bastards Series. Locke Lamora and Jean Tannen are back at it again, this time taking their considerable skills at gambling, thieving and swindling to Tal Verrar. Tal Verrar is home of the Sinspire, a huge and exclusive casino that holds a great deal of wealth in its vault. Unfortunately, there are some in Tal Verrar who have other ideas on how to utilize the skills of the Gentlemen Bastards. Jean and Locke are, for the first time, forced to accede to other people's agendas and even become pirates. But they never lose sight of their original goal. My gosh, it's a lesson in masochism to try to write plot summaries for some books! This is one of those books that teaches that lesson. 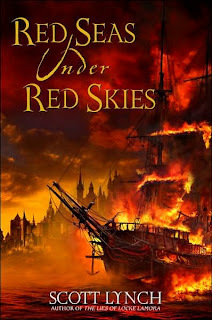 I learned another important lesson from Red Seas Under Red Skies. I really, really don't enjoy nautical adventure stories. At all. Unfortunately, I would say at least half of this novel takes place on the high seas. I imagine Scott Lynch did a lot of research on pirates and ships and seas before writing this book; he then suffered from what so many authors seem to suffer from- feeling the need to include every bit of that research somehow in his book. I felt like I needed a thesaurus for quite a bit of the boat sections. Eventually, I just started skimming any conversation that had a lot of "ship terms" in it. I also skimmed most of the fight scenes. This, er, led to me skimming a significant portion of the book. Scott Lynch writes "action fantasy." It's historical, but more Wild West than medieval Europe. It's not steampunk. It's a very cool sub-genre, and I haven't read anything else quite like it. I thoroughly enjoyed The Lies of Locke Lamora for that reason- it was fresh. And I feel that I would have enjoyed this book a lot more, too, if more of it had taken place on land. But, alas, it was all at sea. I appreciated the character development in this book, as we got to know the sidekick much better and more deeply than we ever did before. And the friendship that exists between Locke and Jean is so deep and wonderful to read about. But at the same time, we learn frustratingly little about anything else. Lynch has planned a seven-book series, though I don't know when any of the other books are coming out. But at the end of book 2, I still have absolutely no idea what the real plot of this series is. I have a vague inkling, but I'm sure I'll have forgotten all about it by the time the third book comes out. We learn nothing more about the mysterious woman from Locke's past, about the Bondsmagi that seem out to get Locke, or about what might happen next. I am sure that Lynch has an idea in his mind, but I wish he'd be a little more generous with his readers. What it seems Lynch spends the majority of his time writing is one-liners. This book is littered with all sorts of colorful and demeaning insults and swears, abundant wordplay and jokes, and a lot of sharp-edged conversation. That's fine, but to me it kind of seemed like Lynch was trying to hard to find ways of showing off his astonishing collection of swear words. He also had a couple of those scenes that are supposed to be humorous but end up just being awkward, around the concept of "the people in the room next to mine are going at it very loudly and it's disrupting my life." Honestly, just leave those out. Please. It's better for everyone. And for goodness sake, please leave out the whole "martyr for a greater cause" thing that seems to recur in almost every fantasy novel. You're writing about pirates and thieves who loot and burn and kill people for a living, Mr. Lynch. No need for extra drama, over and above that. It sounds like I really disliked the book. I didn't, really. I was very "meh" about the whole thing and that was disappointing for me as I bought the book in hardcover right when it came out (and then let it languish on my shelves for almost three years), and was really looking forward to an exciting adventure. I hope the rest of the series (whenever it is published) takes place on land. I don't think I can take another Ocean's Eleven a la Pirates of the Caribbean! It's too bad you didn't enjoy the book more. But that cover sure is eye-catching! Sounds disappointing. I hate when books feel like background for upcoming books. I hadn't thought of writing summaries as masochism, but you are right--in some cases it really does seem that way! Just wanted to let you know I have an award for you over at my blog. If your blog is award free or you choose not to participate, no worries - just my way of saying I enjoy your blog! I have some James Nelson books to read that I haven't got round to yet. I think in a way they may be similar. I thought the Master & Commander series was heavy on the nautical as well, but the characters and the writing were so good it was worth it. Too bad The Gentlemen Bastards weren't like that for you. The use of all the nautical terms has always fascinated me. There are a zillion and I can't keep them straight, but here are all these uneducated guys throughout the ages who have mastered all these as well as the skills to put them to use. (And moreover, if you look them up, you see that many of them have pronunciations nothing like their spellings, like "forecastle.") Just amazing! Such a fabulous name for a series! I must admit to avoiding all nautical books as they have never appealed to me, but the title of the series really does appeal to me. Chris & Marie - I don't think I'll be trying the Master & Commander series any time soon! That combines the ship language with battles, so I'd be skimming the whole book! Enjoyed the movie, though. Vivienne, Sassy, Literary Feline, Katy - I don't know if I'd be AS disappointed with the book if I hadn't had such high hopes for it, you know? I think a two-novella prequel book comes out next year, if you guys wanted to check out the series without getting too enmeshed in it. Bookmagic - Agreed. So annoying. Blodeuedd - I think you might give the first book a try if you can find it. I can't imagine reading it in another language because of all the very colorful slang used. But maybe it's a really good translator! Romantic Query - Thank you so much! I don't really post about awards on my blog, but I appreciate your giving me one! I love your blog, too. So informative and pretty! Ah, this is the book you mentioned to me earlier. I am not sure that I Would like this book, and I am positive that all the nautical bits would be boring to me. That's one of the reasons I have steered away from The Master and Commander series (though I do have the first in the series) Sorry this one was such a sub-par read for you. I agree with the poster who said that the cover is beautiful, but alas, you can't just read the cover! Aargggh. Why do stories have to be so long nowadays? Why has a “trilogy” come to mean “between six and twelve books”? Chris & Marie - I don't think I'll be trying the Master & Commander series any time soon! That combines the ship language with battles, so I'd be skimming the whole book! I know what you mean. To some extent, I want to make the usual quibble about people who claim not to like fantasy novels missing the point by claiming they’re “about” elves, dwarves, and dragons, or whatever, when really they’re actually about (or “about” again) the same universal concerns as the novels these people claim to like instead (only, as I always say when possible, the fantasy versions are thrown into sharper and more imaginative relief by the heightened fantasy setting), but, nevertheless, you’re quite right: there does come a point when each of us, happily, has our own tastes -- and some things, or, more particularly, some milieus, just don’t get on with us. Ah!! I am so sorry you did not enjoy this book! Or that you do not enjoy nautical books!! I actually preferred this one to the first one - partially because of the fact that it takes place on the sea and partially because I was expecting it to be as graphic as it was (which is the main reason I really didn't like the first one - too graphic). Nymeth- It's quite possible it would appeal to you! But maybe read the first book first. Mark- I completely and absolutely agree with you about the length of fantasy series now. I think this book could have been significantly shorter than it was, too.